The text box and the label controls both have an Angle property that controls the rotation of the control. This means that you can rotate the text in both positive and negative directions. Getting the desired result can be a bit tricky because the way the rotation is shown in the Designer is not the same as the print out. In the Designer, you should create a normal text box with the desired height and width. When the report is rendered, this text box is then rotated. Text alignment determines the location of the rotated text. 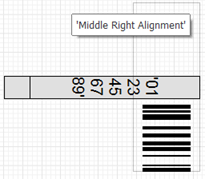 If you specify a Left alignment, then the text is rotated with the left side fixed, and vice versa. We suggest you play around with this feature a bit. It will most likely take some time to get the hang of how this feature works.